You'll find plenty of places to visit near Honolulu: Waimea Bay (in Haleiwa) and Kailua Beach Park (in Kailua). 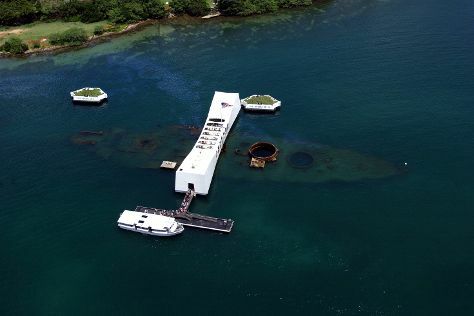 There's still lots to do: pause for some photo ops at USS Arizona Memorial, tour the pleasant surroundings at Waikiki Beach, take in the pleasant sights at Diamond Head State Monument, and trek along Manoa Falls. To find ratings, photos, traveler tips, and more tourist information, use the Honolulu road trip site . San Francisco to Honolulu is an approximately 8-hour flight. You can also do a combination of train and flight. Due to the time zone difference, you'll gain 2 hours traveling from San Francisco to Honolulu. In June, Honolulu is somewhat warmer than San Francisco - with highs of 86°F and lows of 73°F. Wrap up your sightseeing by early afternoon on the 16th (Sat) to allow enough time to travel back home.